Fred D. Gray, past president of the Alabama State Bar Association and the National Bar Association, and past member of the NCBP Council, has been named the 2018 NCBP Fellows Award Winner. Fred David Gray, a native of Montgomery, Alabama, currently lives in Tuskegee and is a civil rights lawyer. Admitted to the Alabama and Ohio Bars, Gray is also admitted to practice in the following Courts: Supreme Court of Ohio, 1954; Supreme Court of Alabama, 1954; U. S. District Court for the Middle District of Alabama, 1955; Supreme Court of the United States, 1956; U. S. Court of Appeals for Fifth Circuit, 1958; U. S. District Court for the Northern District of Alabama, 1963; U. S. Court of Appeals for the Sixth Circuit, 1968; U. S. Court of Appeals for the Eleventh Circuit, 1982; Tax Court, 1968. Gray's legal career spans over 60 years, and he is one of the first African Americans to serve in the Alabama Legislature since reconstruction. Gray served as the President of the National Bar Association in 1985. In 2002, Gray was the first person of color elected as President of the Alabama State Bar Association, and served as its 127th President for the year 2002-2003. In 2003, he was selected for a three year term as a member of the Executive Council of the National Conference of Bar Presidents. Currently he is the senior managing shareholder in the law firm of Gray, Langford, Sapp, McGowan, Gray, Gray & Nathanson P.C., with offices in Montgomery and Tuskegee, Alabama. He serves or has served as a member of the Board of Trustees of Case Western Reserve University, a member of the Board of Trustees of Faulkner University; a Master Bencher of the Montgomery Chapter of the Hugh Maddox Inns of Courts; a life member of the National Association for the Advancement of Colored People, and a Fellow of the American Bar Foundation. In October of 1999, Gray became a Fellow of the American College of Trial Lawyers. He also serves on the Board of Directors for the Alabama Department of Archives and History. Mr. Gray's awards a many. 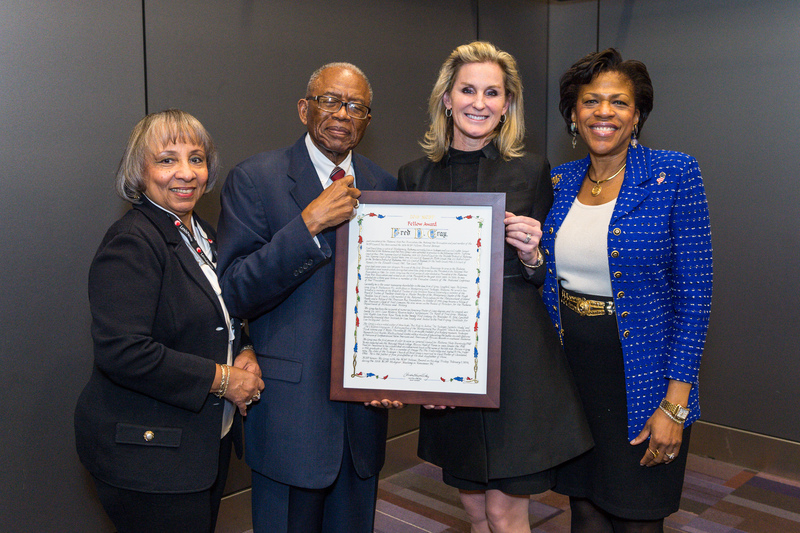 In 2017,Case Reserve held a Symposium: In Honor of Fred Gray: Making Civil Rights Law from Rosa Parks to the Twenty-First Century. 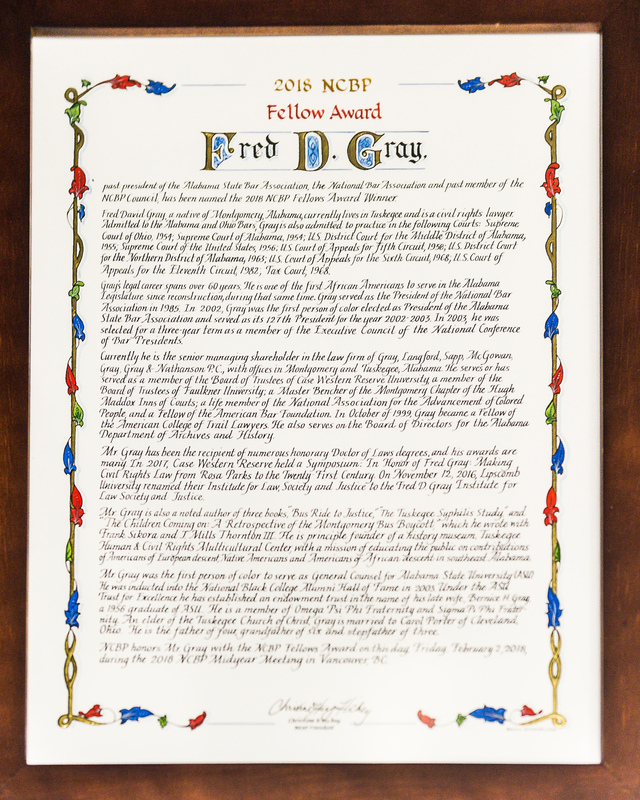 On November 12, 2016, Lipscomb University renamed their Institute for Law, Society and Justice to the Fred D. Gray Institute for Law Society and Justice. His full biography provides a list of all his numerous awards and recognitions. Mr. Gray is also a noted author of three books, “Bus Ride To Justice,” “The Tuskegee Syphilis Study,” and “The Children Coming on: A Retrospective of the Montgomery Bus Boycott,” which he wrote with Frank Sikora, and J. Mills Thornton III. Mr. Gray was the first person of color to serve as General Counsel for Alabama State University (ASU). He was inducted into the National Black College Alumni Hall of Fame in 2003. Under the ASU Trust for Excellence he has established an endowment trust in the name of his late wife, Bernice H. Gray, a 1956 graduate of ASU. He is a member of Omega Psi Phi Fraternity and Sigma Pi Phi Fraternity. An elder of the Tuskegee Church of Christ, Gray is married to Carol Porter of Cleveland, Ohio. He is the father of four, grandfather of six and stepfather of three. 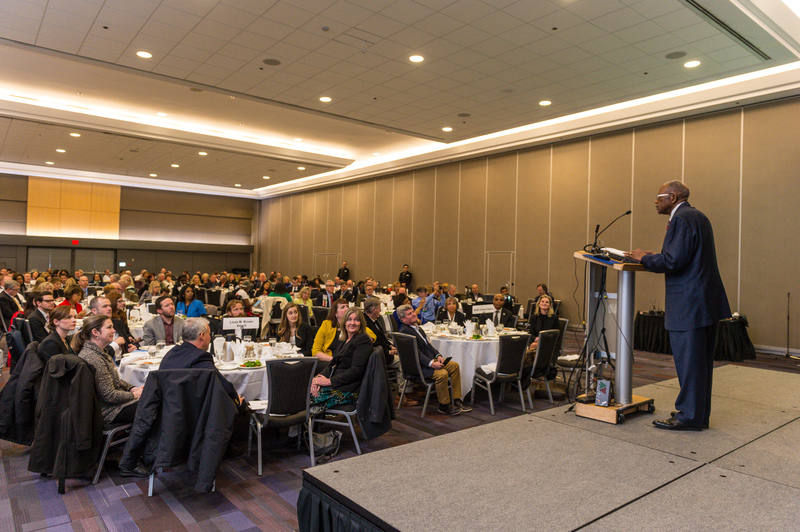 NCBP honored Mr. Gray with the 2018 NCBP Fellows Award at the Midyear Meeting during the NCBP/NABE/NCBF Joint Awards Luncheon on Friday, February 2, 2018, at the Vancouver Convention Center East in Vancouver, BC.